The Samsung Galaxy S8 was something quite special when it launched. It was a phone that was unlike anything we'd seen on the market. And even now, almost two years on, it's still stunning, especially for today's lower price point. The screen is brilliant - clear, sharp and offers lovely color reproduction to make movie watching a dream, and that's before you've even got to the fact it has a screen larger than the iPhone 8 Plus in a chassis that feels more like the iPhone 8. Though this is slightly less remarkable now that Apple has fully switched to the all-screen design with all its latest handsets, such as the iPhone XS. 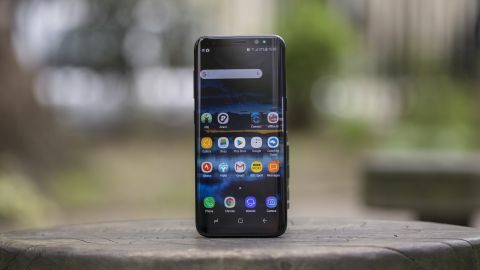 Update: The Samsung Galaxy S8 is now cheaper than ever, but with the Galaxy S10 looming it will soon be two generations behind. The Galaxy S8 isn't perfect - in the search to squeeze the screen in so completely, other factors were overlooked: namely, the placement of the fingerprint reader. If you want this phone, you'll need to answer this question: are you OK using an iris scanner, one that doesn't always work when you want it to? And if you're looking for something even bigger, and with a much-improved battery life to boot, then the Galaxy S8 Plus is the way to go - although both have now been replaced by the Samsung Galaxy S9 and Galaxy S9 Plus. These are iterative upgrades over the S8, so if you want to save some money the now-cheaper S8 is still a great shout, but if you want the very best Samsung has to offer then it's the S9 duo (or the Samsung Galaxy Note 9) that you need to be paying attention to. Or at this point you might even want to wait for the Samsung Galaxy S10. The Samsung Galaxy S8 carried a hefty price tag when it arrived in April 2017, but close to two years on the cost has reduced significantly, making the phone an attractive proposition for those who find the S9 a little on the steep side. At launch, the SIM-free Samsung Galaxy S8 price was £639 ($724.99, AU$ 1,200), but now it can be found for just around £360 ($460, AU$720). In the US, Amazon has it for $462 unlocked – a $265 price drop in under two years. We spent a week thoroughly testing the Samsung Galaxy S8 when it first came out - watch our video below to see how we got on. You will find over a few months' use that you'll get used to this - we've found after intensive testing it's not terrible... but it's certainly not optimal. There's nothing more infuriating about this feature than the fact you can't see if you're 'positioning' your face correctly. There's definitely an angle to hold it at that's optimal... but you have no idea what it is, or why. This issue has been increased now that Apple has invested seemingly billions in creating invisible dots that fire into your face to verify your identity the same way... the iPhone X is big competition to the Galaxy S8 as a result. That would have been perfect, as it’s the way most people fire up the screen anyway. It's a feature that we're now seeing on other phones such as the OnePlus 6T, and which is rumored for the Samsung Galaxy S10. But clearly Samsung couldn’t make this work effectively on the S8, so decided to shove the fingerprint scanner way up the back of the S8, as that was the only place left to put it that didn’t require some last-minute retooling of the phone. That's the only logical explanation, as otherwise why wouldn’t the fingerprint scanner be above the Samsung logo, which would be a perfect place for it? The other big feature that’s launched with the Samsung Galaxy S8 is Bixby, the brand’s voice assistant rival to Apple's Siri, Amazon's Alexa and Google's less-interestingly-named Assistant. Those who've used the Galaxy S3 and S4 will remember that Samsung already tried to match Siri with S Voice, but it was a bit pointless, especially when Google's voice chops got so gosh-darn good. The aim here is to make Bixby an indispensable accompaniment to your daily life, reminding you of things when you need them, letting you know what you're looking at, and being a single-button one-stop shop for all the information you need. In fact Samsung is so confident that Bixby is going to be brilliant that it's popped a button dedicated solely to this function on the side of the phone. Yep, a phone that's so tightly designed that it can't even have the fingerprint scanner in an accessible place has a whole key dedicated to Bixby… and it's very hard to see why right now. Bixby is pretty mundane though, despite having voice functionality added in now, especially as it's inherently inaccurate for voice. We tested for a while, but as it can't support many third party apps or properly understand what's being said it seems a bit futile. It will probably get better over time, but most people won't care about that. So what does Bixby mean to you, the new phone buyer? Well, nothing. It's average at best, and pretty much useless at worst. Bixby Vision, a little icon that lives in the corner of the camera, will be able to analyze what's being shown through the camera's viewfinder (both live and from a taken pic) and let you know whether you can buy it, recognize the image and given information or let you know about a place you're checking out. Except the results of image recognition just show you things on Pinterest, the shopping element seems to recognize almost nothing at launch and the places option is pretty patchy. It's slow to work out what it’s looking at and, overall, it’s just a waste of screen right now. It's contextual and interesting, and you can pin your favorite elements (like Spotify, for instance) to the top for easy access from anywhere in the phone. It's nothing earth-shattering, but it's pretty neat – although there is a maddening pause every time you open it for the first time, as if Bixby is trying to remember where it left its home page. The good news is you can disable the Bixby button from opening the Home screen, which is great as so many times we hit it instead of the volume key. It's a poor placement. And then there's Bixby Reminders, where you'll be alerted to things you've made a note of in the past. You can set a location trigger to remind you to buy fruit when you pass a location, or ping you at a certain time to remind you to call someone. None of this is exactly new though, and there's absolutely no reason why you'd buy the Samsung Galaxy S8 for Bixby. Samsung is pretty jazzed about Bixby, and the fact that it'll be able to understand things contextually in the future. Right now it only can work with a handful of native apps (not even all of them...) and there’s no interaction with third-party options. But from this acorn, Samsung insists, a mighty oak will grow. That's the world Samsung is promising, and if you purchase the S8 you'll be buying into that promise. However, right now, that's all it is... and there’s no way we can recommend a phone based on a promise, as Samsung could just pull the plug on a feature like Bixby if it really can't get it to work properly, and a few months on we've seen nothing that suggests it's going to conquer the world of AI.